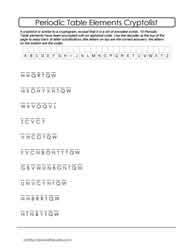 Here are cryptolist puzzles for academic science related to the Periodic Table studied in high school chemistry. They are very challenging because no hints are given for any letter substitutions for the list of 10 out of over 100 plus Periodic Table of Elements. To decrypt the list, knowledge of the Periodic Table, its elements, word structure and letter patterns help greatly to start the decryption of the alphabet code used in these puzzles. Enjoy!